Chipmunks of North America number more than 20 different species, with the eastern and least chipmunk the two most prevalent. They are not an endangered species, and indeed you're likely to see them almost anywhere there is vegetation. The only species you won't find is the Siberian chipmunk, which inhabits Asia. Chipmunks, or tamias (meaning "storer"), are a type of rodent related to the squirrel family. Easily identified by their small stature -- much smaller than the average squirrel but larger than a mouse -- with a striped coat, dark eyes, bushy tail and fat cheeks, these rodents dart across lawns and sidewalks in the summer scavenging for food to be stored in underground burrows. In winter, they enter a near-hibernation state, awakening only to eat stored food. If you live in the eastern United States or southeastern Canada, chances are you've seen the eastern chipmunk. These chipmunks are usually 5 to 6 inches long -- but can get as tall as 11 inches -- and weigh 2.5 to 4.5 ounces. They have a brownish-red coat, two white stripes above and below their eyes, and brown and white stripes down their backs. They typically inhabit deep forests, but sometimes live in rural or suburban areas. Tamias minimus, or least chipmunk, is a smaller version of the eastern chipmunk and can be found throughout North America, particularly in the western states as well as western Canada; some are also seen in Michigan, Wisconsin and Minnesota. This species is smaller than the eastern -- 7.2 to 8.5 inches tall -- and weighs 1.1 to 1.8 ounces. The least chipmunk can be found in open areas, such as forests, but also near water. The only species of chipmunk threatened by extinction is the Palmer's chipmunk, which can be found only in the mountains west of Las Vegas, Nevada, and is currently being monitored. 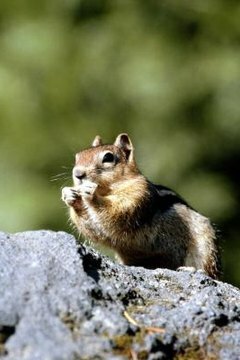 Of the 20 other species, the most noted include the yellow-pine chipmunk and the red-tailed chipmunk, both of which are related to the least chipmunk and are found in the western states. Townsend's chipmunk inhabits only the extreme southwestern corner of British Columbia.